Saint Ulrich was born around 890, and became the Bishop of Augsburg, Germany. He was the first saint actually canonized by a Pope, John XV, in 993. Ulrich was a really sickly child, so his parents sent him to a monastery for study and so he could die on someone else’s watch. There he adopted a whole foods plant based diet, and his health improved so much that he was able in later life to rebuild churches, feed and minister to the poor, and live on very little sleep. There is an interesting story about St. Ulrich and a fish. Now Ulrich was not one of those snob vegans, and as such he didn’t mind when others around him ate meat. It seems that he and a friend, St. Conrad of Constance, were walking and talking until well into the night and forgot to eat their picnic supper. [Who forgets to eat? Dude.] Anyway, by the time they remembered, it was past midnight, and they happened to now be on a fast day, which meant no meat, only fish. 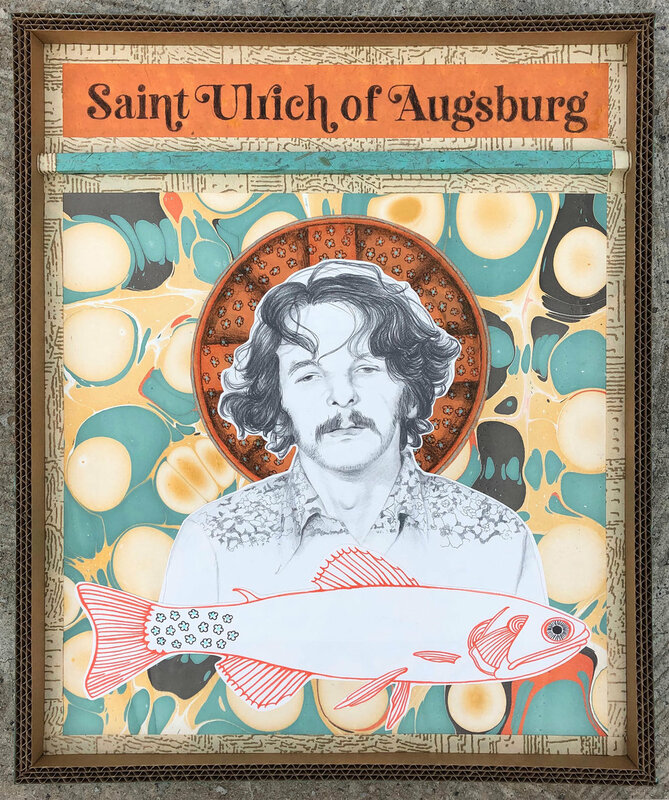 When they opened up their picnic basket, the meat Ulrich’s friend Conrad had packed had turned to fish, causing them both to exclaim, “Wahoo!” As a result, St. Ulrich is often pictured holding a fish. On the morning of his passing, [vegans die too, you know], he had ashes laid out on the ground in the shape of a cross, sprinkled with holy water, and he laid down on the cross and died. Being vegan, Ulrich was clearly malnourished, and as such , he is often called upon in times of dizziness and vertigo. So I depicted a protein deficient Ulrich channelling a 70’s vibe, which we all recognize was a vertiginous time in American history. I added a fish, a cross of ashes on his halo, and a semi psychedelic background with a sprinkling of flower power. Cheers to you, St. Ulrich of Augsburg!